Welcome to Week Two of a month long celebration of artists and their work from Marvel Fanfare, a comic that ran from 1982-1992! Today’s featured artist is the amazing Kevin Nowlan! Feast your eyes on his rendition of Doctor Strange (click on the above image for its full size glory) as Stephen fends off a horde of demonic creatures! 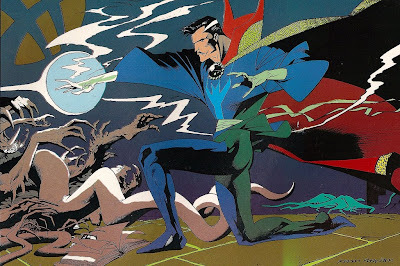 Those spindly spell-casting fingers certainly suit the wizardly might of Stephen Strange (and also a surgeon) but also take note of the musculature of his legs (there’s a reason why these guys wear tights, folks)! The flow of the cape gives the piece movement and the detail of the cape’s trim is staggering! Nowlan is able to simultaneously ground the good doctor in the mundane here and now while propelling him into the fantastic future! A gorgeous piece of work from Marvel Fanfare #45! Dagger (of Cloak & Dagger fame) kicks off our Kevin Nowlan Portfolio featuring a bevy of beautiful Marvel superheroines. His style features elongated anatomy in which legs and arms go on forever and faces have a distinct profile, oftentimes with exaggerated noses and cheekbones. His style has changed quite a bit since he drew these pinups, but his level of detail and slender lines are very much still Nowlan hallmarks. The flowing hair and closed body language in the above image give the figure a sense of vulnerability. I like to imagine that Tandy is missing Tyrone and isn’t sure how to carry on without him. Usually shots of heroines from behind can come across as exploitative, but here her back is turned in a way that reflects her fragile emotional state. The streaming hair simply adds to the wistfulness. Dagger and all of the images below are from Marvel Fanfare #18. Phoenix bursts forth in all of her cosmic power! Fiery, focused and fierce! The bird’s eye view that we get of She-Hulk makes me feel like a member of the paparazzi about to smashed! Nice tan line, Jennifer! Black Widow poses in a portrait with her totemic namesake, looking cool and collected as befits a spy of her caliber. For the record, this is not my favorite Black Widow costume, but I like the simplicity it affords Nowlan’s drawing. Nova, former herald of Galactus and one time girlfriend of the Human Torch, smiles serenely at the viewer in a rare moment of repose. It is a rare moment of peace for a character that never found any in her adventures. The current status of Frankie Raye (Nova’s human name) in the Marvel Universe is deceased. Solar Flair: Birth of the STORM! I love Kevin Nowlan! Such a distinctive style. He’s also one of my favorite inkers, able to make ANYONE look even better. I’m getting kind of a Grace Jones vibe from Frankie Raye’s face. Excellent post! What a blast from the past. There’s something so crisp and sharp about his 80’s work. Ken is correct, who ever he inks will look amazing just because of him, for example punisher #6, which also has a great mignola cover to boot.